Summary: In this almost wordless book, a girl starts spying on the boy who’s just moved in next door. 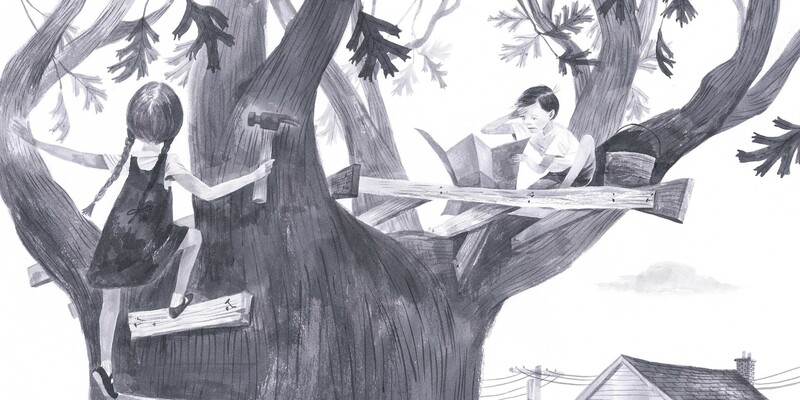 She sees him reading a book, then removing part of the wooden fence between their houses to nail rungs on to a tree. Stealthily following him up the ladder, she discovers him scratching his head over plans for a tree house. She pulls a hammer out, and the only words in the book appear. “Hi.” “Hi.” The two of them get to work, and before long, a house begins to emerge. As they build, splashes of color appear in the previously black-and-white illustrations. On the last page, they wave from the yellow-lighted windows of their houses, the completed treehouse standing between them. 32 pages; ages 4-8. 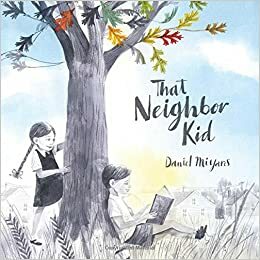 Pros: A simple story of friendship, told entirely in the beautiful watercolors of Daniel Miyares. Cons: Kids, don’t try unsupervised hammering and sawing at home!